Okay, you’ve notices a few creepy crawlies around your home. It looks like an infestation of ants, and that’s enough of a problem for you. But then you remember that termites can damage your home. And don’t they look a lot like ants?! 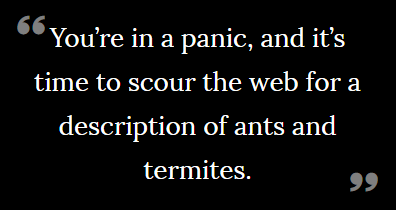 Now you’re in a panic, and it’s time to scour the web for a description of ants and termites. Take a deep breath; let’s take a look at the anatomy of ants vs. the anatomy of termites. Both ants and termites have three body sections. 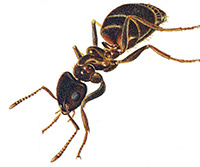 Ants, however, have a more triangular head. Their midsection and hindquarters are hourglass shaped. They have a small, pinched waist. Like termites, ants can grow wings during the warmer months. However, ant wings are dissimilar in size; there are four wings on an ant, and the front wings are larger than the back wings. If you still can’t narrow down the identity of the pest at hand, take a look at their antennae. Ants have antennae that are jointed in the middle. Termites have straight antenna. Their wings are all very similar in size. They also have a broad waste. Their overall shape is much more cylindrical than the ant. The width of a termite is relatively unchanging along the length of its body. Take note that swarming termites will not damage your home. Worker termites (termites that never grow wings) are termites that devour and damage wood. If there are swarming termites around your home, it’s likely that worker termites reside nearby. That means it’s time for a termite inspection! If the jury’s still out on the identification of the insect that you’ve found in your abode, you can contact the pros here at Hi-Tech Termite Control. We can visit your home and inspect the pest at hand. Moreover, if we do find termites in your home, we can identify the source of those termites, and we can offer up a solution to exterminate the unwelcome pests. Take note, we offer a specialized microwave termite treatment option. It’s completely noninvasive; you won’t have to pick up and move to a hotel for a few days as you would if you’d opted for fumigation termite extermination. Please, feel free to get in touch with us to learn more about termites or to schedule an appointment. You can also learn more about our microwave termite treatments here.